HI! Why after update in Nougat Aida shows only 4 working cores, other 4 (A57) just "sleeping", however, "SystemPanell" app show correctly result. 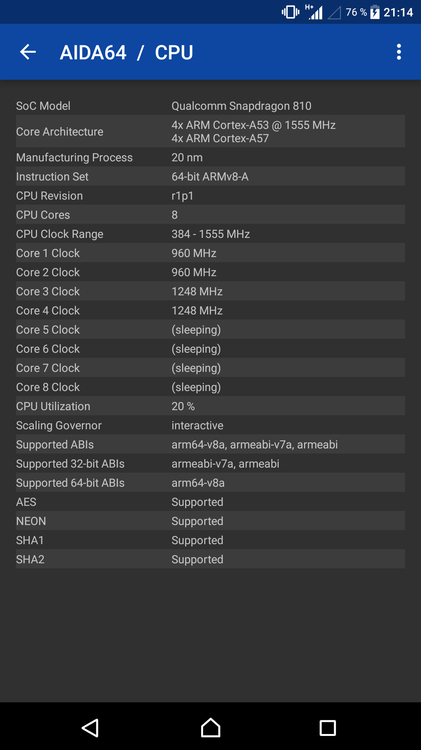 Aida and Cpu-z have same problem, always shows only 4 working cores. Phone Sony Z5 Snap810, more powerful A57 not "working" and didn't show max speed of this. In MM and early, everything worked correctly. It must be due to a system pecularity that is specific your particular device. We'll try to get a similar device to check it out. On our existing devices, including a Snapdragon 810 based Nexus 6P (running Android O DP2 right now), we can see no such issues. On our Nexus 6P all 8 cores are properly measured. Before the Android O update, it used to work properly with Android 7.x and Android 6.x as well.